Beat cream cheese and butter together until well combined. Add garlic, herbs and salt and pepper until well combined. Cover and chill slightly, the form into 2 logs. Wrap each log tightly in plastic wrap. Refrigerate or freeze. Okay, this is wonderful. I usually add oregano, too. 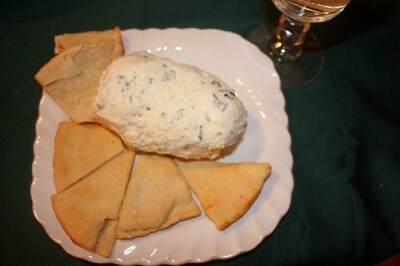 Makes a great appetizer, but I also cook with the leftover cheese, using it in stroganoff or other cream dishes. I nibbled a little on this using pita chips since forgetting crackers at the store. Pita chips complemented the cheese. I had to use some ground herbs but anxious to try this using all fresh herbs to see if there is a difference. This will make an excellent sauce for beef stroganoff or any other creamy dish because it is tasty. It is not just another cream sauce that may or may not be flavorful. I made smaller loaves so there is one in the fridge and 2 in the freezer. The electric hand-mixer got a workout beating the butter and cream cheese. It worked so hard it started to smell. Think it might be time to use the other one Joe and I got as a shower gift 18 years ago. It is easy! This sounds really very delicious. Thanks for stopping by and commenting. It is delicious and do not be afraid to experiment using it in different dishes.